A celebration indeed as music is at the heart of the festival’s original philosophy. The most talented artists to a fusion-based gathering with Gnaoua masters and together they will create moments of musical improvisation. Absolutely polyphonic, mixing the most diverse variety of styles the Essaouira Festival evokes the most unique emotions, top moments of communion through a high variety of music. It is a true-to-life experimental musical laboratory, an open sky studio that celebrates its 20th anniversary offering a first in programming. All the big names will be there for concerts full of energy where the legendary blues of Lucky Peterson will pair with the aerial jazz of Bill Laurence, the frenetic rhythms of Carlinhos Brown or the eminently wise voice of Ismael Lô. The musicians, friends of the Festival and true actors and witnesses of this special adventure are returning to the Essaouira stage for revisited creations like the residency formed by Maalem Abdeslam Alikane and Ray Lema who have been playing together for 20 years. Mention can also be made of the refined performance conceived by Roy Ehrlich and his colorful company with the Band of Gnaoua. Not to forget with all this the unbridled energy of Amazigh Kateb and Gnaoua Diffusion. But the festival has as its leading force the desire to always renew itself. This year several residencies have been specially created to celebrate this 20th anniversary. Truly original presentations like the pairing of indo-Pakistani Sufism and tagnaouite offered by Titi Robin or the Guinea trip of Sidi Ben Ali Hamdouch created by Maalem Hasan Boussou and friends. Essaouira offers those looking for spirituality true music and intemporal benchmarks, the possibility of meeting and expanding horizons through dialogue: Since its inception the Festival strives to keep alive the richness of the Moroccan musical heritage. This year the young Moroccan musical stage and maalems from across the country and traditional companies will take part in this celebration. A pioneering and authentic Festival, the Gnaoua and World Music Festival will come to the city of the Trade Winds, the former Mogador, and together sing the praises of freedom and tolerance. The magic of the Festival will be there and isn’t it true that 20 is the best age of all? Marrakesh is more than just a city. It is a pearl polished by history and its tradition of hospitality which, for centuries, has known how to welcome visitors. The Majorelle Gardens house a collection of plants from the four corners of the earth flourishing among elegant ornamental lakes and an Art Deco villa. Yves Saint Laurent’s ashes were scattered here. You leave this enchanted spot in one of the many horse drawn carriages available in the city and take the inevitable trip to the palm grove. From there, you continue to the Ménara, one of Marrakesh’s symbolic places. This elegant building, which you can recognize by its green tiles, is surrounded by an immense ornamental lake. Marrakshi families come here to enjoy this cool spot during heat waves. Those who satisfy their desire to discover and to meet people are sure to enjoy simple joys in Marrakesh. The usual price for a ticket with CTM or Supratours Buses to Essaouira is usually about 70.00 Dirham per person. This approx 6.50 Euro per ticket. There is also a 10.00 Dirham luggage charge on both Bus companies. For solo travelers who want to get to Essaouira, this is good deal. The buses are usually comfortable and you really can’t beat that price. Is the Bus to Essaouira really a good deal? So, the Bus ticket price is good, but is that everything that you need to pay to get to your Hotel in Essaouira when using the bus? First, you need to get from Marrakech Airport to either of the Bus Stations. Public taxis should not be considered for this…they are old, clunky and uncomfortable with no air conditioning. Also, you really don’t know how much you are going to have to pay for a public taxi from Marrakech Airport. The public taxi drivers often overcharge people. That’s exactly the reason why we started marrakechtaxitransfert.com ! Transfer from Marrakech airport to your hotel in the Marrakech medina will be in a very comfortable car. Your driver will be at Marrakech airport holding a card with your name once you arrive will be driven straight to your hotel or your driver will help you and get to the nearest gate to your hotel in the medina. Once you arrive to the airport and pass the control your driver will be at the hall waiting for you with a sign of your name on a board. They will greet you and help you with your luggage to get to the your comfortable transfer. Then they will drive you straight to your hotel in medina or guiliz. They will make sure you are the correct gate which is near your hotel will arrange everything so that your transfer will be a real satisfaction. 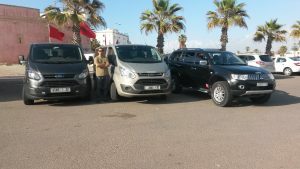 Read more about Private Arrival Transfer: Marrakech Airport to Marrakech Arrival Hotel – Marrakech https://www.marrakechtaxitransfert.com. Marrakech is the second largest city in Morocco and contains some of the most impressive sights in the country. Behind the fortified walls of its ancient city centre (medina) one finds a well preserved city which contrasts greatly with the modern city and buildings on its outskirts. The largest traditional market in Morocco is found here, as well as the Djeema el Fna, a huge and always busy square full of food stalls, merchants and entertainers of all types.